So, who's ready for Halloween?? I'll be honest, I'm asking the question with a bit of trepidation, since I'm not sure that we are anywhere close to being prepared. Much as I enjoy it, Halloween is one holiday that never fails to catch me off guard. Every year, determined to prepare the best Halloween bash ever,I vow to start planning ahead. After all, I only need to... decorate the house, carve the jack-o-lanterns, send out invitations for a great big Halloween bash, and prepare all sorts of innovative tricks and treats. And then, mid-October rolls around, and I realize that time has slipped away.The truth is, we never seem to get around to planning that over-the-top Halloween bash -- though we love taking inspiration from all the great ideas out there on the web and in print. And I'm guessing there are a few more of you out there who feel a lot like we do. Fortunately, we are confident that there's still time (even at this late date) to whip out a pretty awesome Halloween gathering, complete with ghoulish grub and boo-rific beverages. And we can even offer up a bit of help. 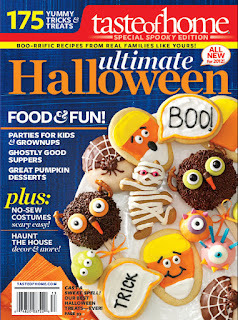 It just so happens that Taste of Home magazine (which is based right here in Greendale, WI) sent me TWO copies of their 2012 Ultimate Halloween edition, a publication filled with brand new Halloween themed recipes, parties, decor, and crafts. And I mean it when I say “full”. 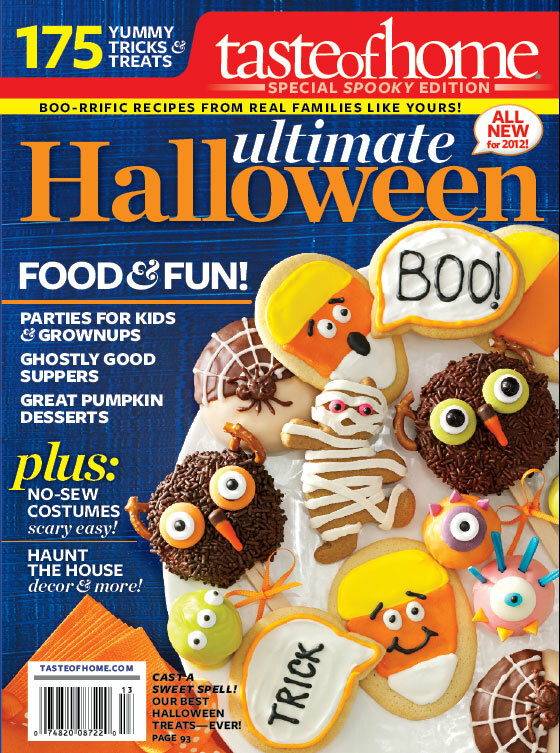 There are over 140 pages of fun inspiration to get you into the spirit of the season and make this the best Halloween ever! Best of all -- none of these ideas go bad, so you can even use them NEXT YEAR! Ghostly Getups - including easy costumes for youngsters, teens, adults, and even the family dog! House Haunters - simple decor ideas, craft projects and more. This special edition of Taste of Home magazine sells for $9.99 on the news stands but you can win one here for free! our Facebook page, and leave a comment on our giveaway post, telling us what your favorite Halloween tradition is. We'll send a copy of the magazine out post-haste to one, randomly selected reader! Our church has huge halloween carnival in the gym. Lots of food, games & candy of course. i always work the game where you stick your hand in a box and guess what body part it is ( grapes= eyes....) Love seeing the kids faces when they reach in. Then go home and watch a Nightmare Before Christmas. While eating candy corn. The post is pinned to the top of the page, so it should be easy to find! Of course, we welcome any and ALL comments you'd like to make here too... they just won't count for the contest.